We can compare the working mechanism of Load Balancer versus HTTP Accelerator when we are using any Cloud based IaaS. There are differences. Through previously published articles, we talked both about Load Balancing and HTTP Accelerator like Varnish. 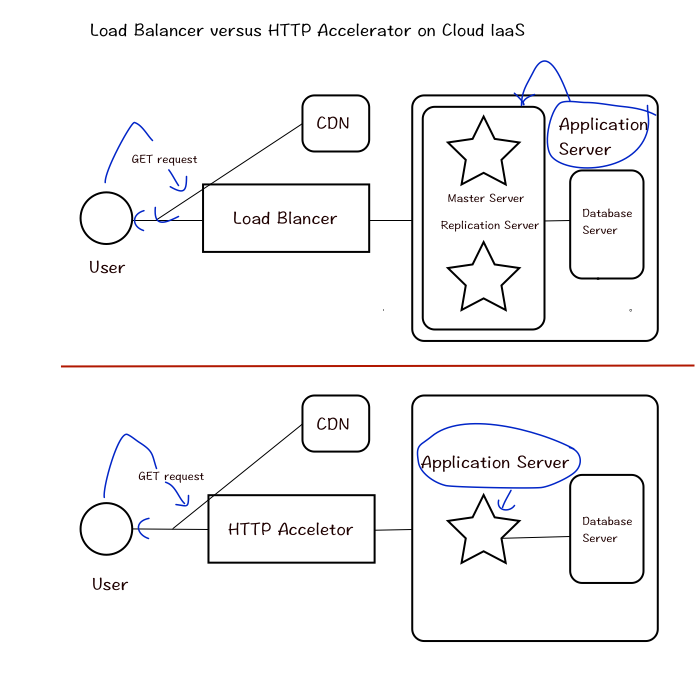 These are actually different type of server setups intended to deploy any Web Application. For a given web application, we consider which server architecture is perfect to use for the particular web application and assumed load, there are many factors like performance, scalability, availability, reliability and most importantly cost effectiveness. On Cloud IaaS setup, we usually use Load Balancer as a Service. We are only using part of big Load Balancing system, i.e. the Load Balancer is not a dedicated system and has all the features of typical cloud based platform. Load balancers can use the same software as HTTP Accelerator like Varnish, but the setup is actually for horizontal scaling. We can add multiple servers to improve the performance by distributing the workload. In this scenario, we are using reverse proxy on layer 7 (application layer). If not rightly configured, load balancer system can become a performance bottleneck. HTTP accelerator setup is using a caching system to enable HTTP reverse proxy, as it can cache, it can be used to reduce the page loading, it reduces the effective load on the application servers. Horizontal scaling with only HTTP accelerator setup is also possible but usually we use the first type of described Load balancer setup to rightly, algorithmically distribute the load. In both cases, we can use a Content Delivery Network (CDN), however, the CDN remains fully independent of the type of setup. This Article Has Been Shared 3896 Times! Cloud OS Installation on Rackspace Cloud Sites is quite simple process. In this guide we will show how to install free Cloud OS Eye OS for online collaboration. Installing Python Application in OpenShift PaaS needs some modification and custom commands as you might not able to run. Here are some tips for Python. Cite this article as: Abhishek Ghosh, "Load Balancer versus HTTP Accelerator on Cloud IaaS," in The Customize Windows, August 16, 2014, April 21, 2019, https://thecustomizewindows.com/2014/08/load-balancer-versus-http-accelerator-cloud-iaas-2/.